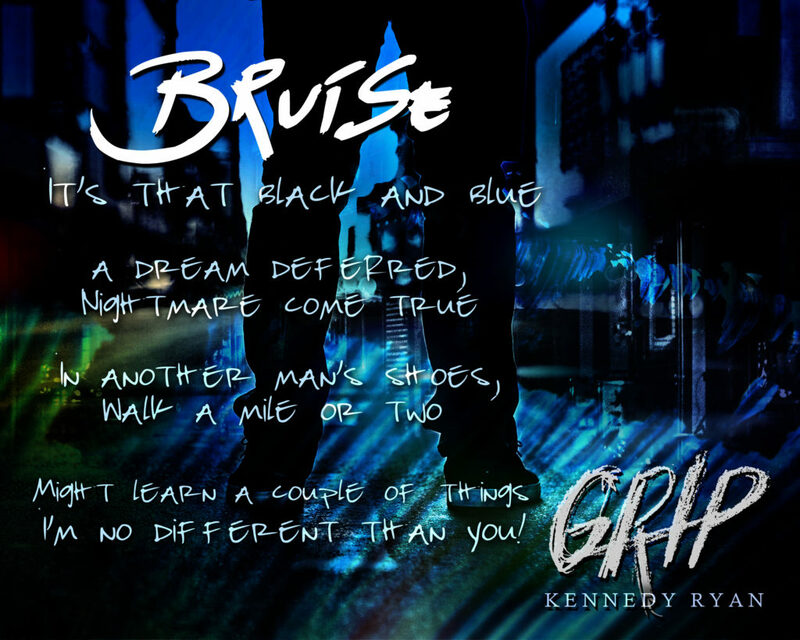 Bruise by Kennedy Ryan, the original piece written for her latest release Grip. Kennedy Ryan shares a special post on the inspiration behind “Bruise,” the original piece written for her latest release Grip. The cursor flashed a warning at the end of the line I’d just typed. Read on its own, the words seared the page, an incendiary challenge. A jagged line in the sand that could shove half my readers to one side, and half to the other. I needed to be careful. I wanted to be fearless. I had to be honest. The hero of Grip, my latest release, Marlon James (Grip to his fans), is a rising hip-hop star, but he’s more than that. He’s a lyricist and a poet. He’s a black man, concerned about black men vulnerable to cops who should be protecting them. He admires officers who run toward danger when most of us run away. He wonders what he can do to bridge the gap between the two. I took several risks writing Grip, confronting, in the context of a love story, prejudices that are often blatant, but sometimes remain hidden even from ourselves. No issue weighed heavier on my mind than that of black v. blue. In the story, Grip gets stopped DWB. Driving While Black, for those unfamiliar. Probably somewhere else in mainstream romance, readers have sat behind the wheel in a black hero’s perspective, glanced in the rearview mirror, seen those blue lights flashing, and wrestled with the fear, frustration and anger born from years of being stopped for no reason…but I haven’t read it. And as I wrote it, I remembered my own husband’s accounts of being stopped most of his life; of him and his friends lying on their stomachs on the ground while their cars were searched. I recalled the first-hand accounts I’d read of black and Hispanic men, even in the last few months in LA, Grip’s hometown, stopped and searched so much more than their counterparts. But I also thought of my friend’s husband, a good cop, a good man who faced down fear every day to protect people like me. Of her anxiety when tragedy strikes, when travesties happen. Incidents that I watch on television from the safety of my couch while her husband wades knee-deep into danger. I wanted to tell both sides of this story. I didn’t want to debate or persuade. I wanted readers to listen; to hear the other perspective. To consider. To understand. To empathize. These are the building blocks of resolution. Our country is more divided than we’ve been in a long time, and many of those divisions still, sadly still, fall along the lines of race. I don’t know how we resolve anything in this current climate. I don’t think we do unless we exchange perspectives; manage to communicate with one another in lower decibels, in reasonable thoughts, in something besides shouty caps on Facebook and Twitter. And yet it requires honesty, and giving each other grace to speak with candor and respect, even if sometimes ineloquently. It requires that we step into the other’s shoes. Usually, we are not all right or all wrong. We are more nuanced than that; the issues more complex than black and white. Or in this case, black and blue. This story models that, I hope. In my small corner of the world, with the only tools at my disposal, my pen and my voice, I hope I demonstrated that. I hope someone on one side of that jagged line in the sand understood the person across from them a little better after reading GRIP. This wasn’t about my personal outrage; my indignation as I watched black men gunned down this summer during traffic stops. It wasn’t about my horrified grief as I watched cops in Dallas ambushed, killed. It wasn’t just about either, and it was completely about both. One of my favorite communicators says sometimes we choose between making a point and making a difference. I really hope, in some small way, the words to “Bruise,” the original piece I co-wrote with a spoken word artist for this book, volley right past just making a point, and manage to make a small difference, even if the only difference is that one person chooses to listen and tries to understand. There are so many other things I could say; so many statistics I could cite to sway you to one side or the other. But instead, I’ll let “Bruise” speak for itself. And for those on both sides of that jagged line in the sand. Signed paperbacks of GRIP & FLOW, the prequel, are up for grabs on Kennedy’s Facebook page! RANSOM by Logan Chance and Jacob Chance is LIVE!